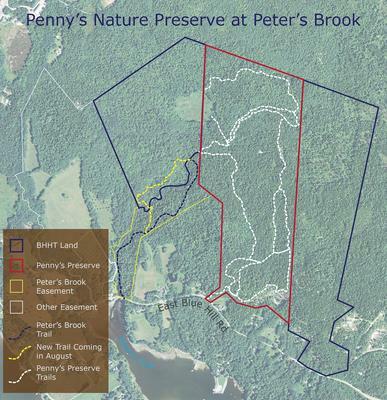 A map of Penny’s Preserve, a new addition to the Blue Hill Heritage Trust’s public lands. Blue Hill Heritage Trust is now the owner of Penny’s Nature Preserve next to its Peters Brook property. The land was a gift from Rich Storck and Aletha Langham. The property, more than 100 acres, will stay open to the public for hiking, dog walking, sports and exploration. As it does with all its fee holdings, the land trust will enroll the property in the Maine State Open Space Taxation program, keeping the property on the tax roll. The preserve has three miles of trails that connect with the existing Peters Brook Trail. The trails travel along the brook and through historic granite quarries. It can be accessed just beyond the waterfall on the Peters Brook Trail or by parking at Peters Cove and walking about a quarter of a mile to the preserve’s entrance on the East Blue Hill road. For more information call 374-5118.